Fairgreen International School is a pioneering education community, with a mission to embrace and promote sustainability in all its forms. Developed to empower students with a forward-looking education, Fairgreen aims to inspire future generations to make a positive impact on the world as ambassadors of sustainable development. 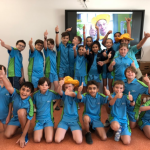 Find out more about how Fairgreen International School are doing on their CFC Dashboard.